THE SERAPI RUG - Composed of the finest cotton and wool, these rugs are typically created using the Ghiordes. Of all the rugs manufactured in the world, few are as debated by academics and collectors as the Serapi rug. The reason for this is its name and classification, with many scholars saying the rug is merely a Heriz rug categorized under a misrepresented designation. The name itself is likely Western-born, as many rug weavers and dealers in the country of Iran don’t even appear to recognize the name. 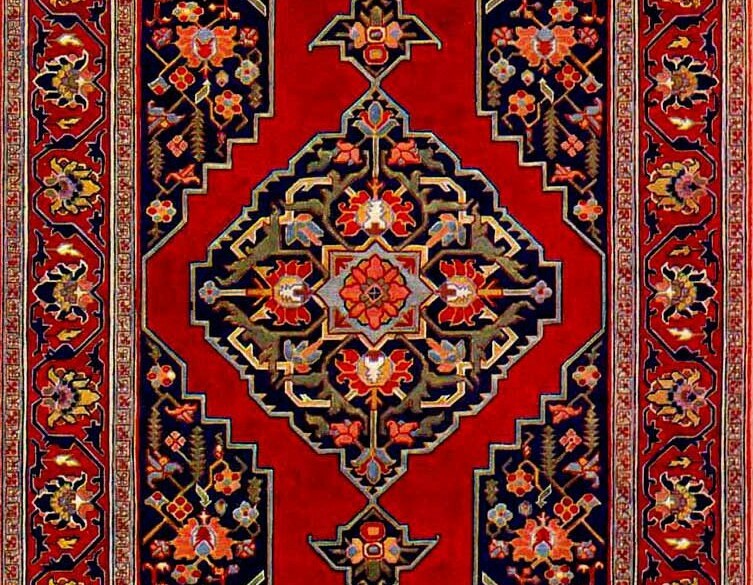 However, because rugs are sometimes classified by the area or tribe from which they originate, many acknowledge the name might very well be derived from a village in Iran going by the name of Sarab. Located between the Bozquosh mountain range and the Sabalan peak, Sarab is one of the more ancient areas of settlement in the East Azerbaijan Province. For centuries, it has been a region well-known for its rug-centric culture, where weavers have produced some of the finest and most cherished rugs in both Iran and the world. Still, the debate even continues as to the location where Serapi rugs are made, with many arguing that it is in the city of Heriz where most Serapi rugs originate. This becomes even more confused when you consider the two places are a mere 82 kilometers, or 50 miles, apart from each other. Yet, regardless of their origin of manufacture, the name still persists, and though the similarities between Heriz and Serapi rugs are also stark, they are significant enough to distinguish these carpets one from another. In comparison to a Heriz, which is a stunning carpet in its own right, a Serapi rug usually exhibits finer details and a subtler color palette than its Persian rug relative. This is evidenced by its higher knot density, referred to as the knots-per-inch (KPI), which allows a weaver a greater amount of clarity with a rug’s design. Consequently, this also means that the weavers of Serapi rugs must endure a much longer period of manufacture than other rugs with lower knot densities; though the results speaks for themselves upon completion, as the Serapi rug has always been one of the most sought after by collectors. Often composed of the finest cotton and/or wool, Serapi rugs are typically created using the Ghiordes method of knotting, though the use of Senneh knots is not uncommon. As expected, the motifs found on Serapi rugs mirror those of other larger cities and villages in the area, taking ideas from artists in both Tabriz and Heriz. These ideas come in the form of floral patterns, geometric designs and tributes to Islamic and nomadic culture; yet some have received their influence from familial ties whose decorations have been passed down through generations. 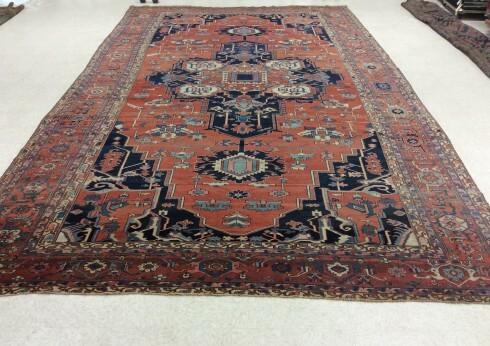 One of the more valuable among Persian, Oriental and Turkish rugs, the Serapi is considered an antique rug due to its manufacture coming to an end sometime around the early 20th century. Any Serapi rugs you find today are usually at least 100 years old, and feature all of the distinct motifs, natural dyes and matured patina you would expect from such a stunning handmade masterpiece. And they are only expected to become even more treasured and priceless as the years go on.